"DANCE as though no one is watching you. LOVE as though you've never been hurt before. SING as though no one can hear you. And LIVE...as though Heaven is on Earth." In commemoration of its 130th anniversary, Bulgari has launched a new ceramic silver pendant to boost its support for the Save The Children initiative. On mark with its 130th anniversary and to boost its support for the Save The Children initiative, Bulgari has added a new ceramic silver pendant to its jewellery collection in hope of generating an additional €1 million (RM 4.5 million) to save children lives. For year 2014, Bulgari launches the new ceramic silver pendant to help with a new cause within the Save The Children initiative, where Bulgari aims to save 50,000 newborn children and their mothers through life-saving healthcare services. With the new goal set in motion, a legion of celebrities has joined the cause including Naomi Watts, Meg Ryan, Tom Welling and Dita Von Teese. In the recent Malaysia launch event, famed local personalities had also lent their hands to support the charity including Datin Sri Tiara Jacquelina and Debbie Goh. As Malaysians, we are lucky to have much support in healthcare for both women and children compared to other less fortunate countries. In the recent Save The Children’s 2014 Mother’s Index, Malaysia was ranked 68th out of 178 countries globally – a great effort in comparison to our regional neighbours like Thailand (72th) and Indonesia (113th). This initiative started in year 2009 when Bulgari decided to take action on behalf of disadvantaged children around the world, as too many children were unable to attain to attain their own aspirations due to difficult circumstances. Inspired by the iconic B.Zero1 jewellery line, the special collection started with just one ring design in 2010 and to date, Bulgari has generated over €20 million (RM 90 million) in donations for Save The Children through the sales of the ring. While the main project financed by Bulgari supports Save The Children in providing child’s education, the additional proceeds of the new pendant will be used to support children and mother’s health issues in poor, conflict-affected countries and in emergency situations across 23 countries in four continents. With the mission at hand, Bulgari continues to strive to give hope and life to the individuals around the world for a better and brighter future. The Bulgari Save The Children ring and pendant are available in all Bulgari boutiques around the globe at the price of €420 (RM 1,700). For more information, please contact your nearest Bulgari boutique or visit the Bulgari website. My son Dani has on quite a few occasions surprised me with some of his thought pieces or writing for school projects, and I like any proud mum, can't help thinking how his thought process is so mature for a kid his age. This following piece was something Dani wrote last week for a school project, following the theme of "Life After Death". Scavenging for memories I now dearly miss. To be with the ones I now miss the most. Happiness, sadness, relief, even pain. To feel them once again. I’d rather hurt, than feel empty. I’d stab myself, just to feel normal, once again. I’d rather jump off a cliff, to feel gravity. I’d give my life, to break the curse. The curse, of life after death. Yesterday marked a really special day in my life. Like the birth of a new baby. Something I've been waiting for for 5 years, to happen. The launch of Enfiniti Academy Of Musical Theatre and Entertainment Arts. It was quite an emotional moment for me somehow, I found myself choking at the beginning of my speech, I guess it was quite overwhelming after the long, long wait. And having to keep so many secrets for so many years, even from my closest media friends! Staying under the radar just to avoid having to say "I can't talk about this just yet". It felt wonderful though. And the people that mattered were there. Friends and family and those that helped make this happen. Like they say, “Give a man a fish, and you feed him for a day. But teach him how to fish, and you feed him for life.” This is what we hope to do, at Enfiniti Academy of Musical Theatre and Entertainment Arts (or ENACT). This is for me, a dream come true. For the last 5 years, I’ve been dreaming of setting up an academy, to train and inspire the finest artists, performers and entertainers of tomorrow, for the industry I love, the world of dreams, hopes, imagination beyond infinity. This is the legacy I hope I can leave behind someday... but for now, I want to LIVE that legacy everyday, for the industry I love, this world of dreams, hopes and imagination beyond infinity. I’ve always been very passionate and vocal about my belief that the indicators of richness or development of a country, cannot be measured merely by how many tall buildings there are. It’s also about the richness of its culture, its liveability, the creative expression, the life and soul of the country. It’s not going to happen overnight I know, but I DO know that today, with the launching of Enfiniti Academy of Musical Theatre and Entertainment Arts (or ENACT), we are one step closer towards achieving that goal. I’m hoping that we will attract the most committed people who will come to work in ENACT, with ENACT, people who will share this vision and mission. We’re very lucky to have found the absolutely talented actor-director Joanna Bessey, who is Course Director of the Academy. And all of this last week, so many others have come forward, talking to our Group VP of Operations, Izan Satrina, offering to impart their knowledge and skills to the next generation of artists. This is going to be a wonderful opportunity, for all those people who have always wanted to grow this industry. These people could be local home grown talent, like Joanna, Pat Ibrahim and Suhaili Michelin, or may come from industries that are richer and more experienced than ours by hundreds of years. Wouldn’t that be wonderful – the world coming together, in the name of art, here at Enfiniti Academy!!! And why not? In our world, the world of performing arts, we speak in a common language, that transcends political and social boundaries! We aim high, we aim for the stars. That’s the spirit and character of Enfiniti Vision Media. And I think there’s no reason to be humble about this. Our shared vision, with the academy, is to actively create greater national awareness & appreciation of the Arts, and to focus on the growth of the Malaysian Arts Industry so it becomes a more vibrant & viable sector of the economy. As a company, we want to engage the Malaysian & regional Arts Communities, to cohesively promote Malaysia as an Asian Arts Hub. Enfiniti aims to create a whole sustainable eco-system of the arts. We stage musicals that are most recognized for quality and production value in this country, and we will now continuously produce the artists and performers who make the shows come alive. Very soon, through our events arm, Kit Kat Klub Events, headed by the talented Azimy Wan Ahmad, we will have non-stop events along the soon-to-be-launched Encorp Strand Red Carpet Boulevard, which will require talents galore, every week of the year. Our absolutely creative Chedd Yusoff will also be heading one of Enfiniti’s most important projects, not just for our company, but for the country, a Malaysian Cultural Village. If you can just imagine this, the concept of the village is that EVERYONE who “lives” in this village is an actor, a performer. So. We NEED a continuous “supply” of talent, internally for our own projects, as well as to feed the growth of the Malaysian arts industry! I am today, boldly stating, that Enfiniti Academy of Musical Theatre and Entertainment Arts or ENACT is a boutique academy that aims to be an incubator of icons, trained in Malaysia, ready for the WORLD. We are ABSOLUTELY committed to producing the highest standards of training in all aspects of musical theatre and entertainment arts. This means, we aim to produce not just performers, but producers, directors, writers, stage managers, set designers of the future. The eco-system of the arts industry. The unique difference between ENACT and any other performing arts academy, is that the environment here will be more of a professional company in rehearsal, rather than that of an educational institution. Students will be exposed to the way a professional company operates, rather than just a school. SO here we are today, it took 5 years to make this happen, but it will certainly be worth the wait. There are a few people that need to be mentioned today, who were integral to the process of putting the whole ENACT project together. This has been Liz Tajuddin’s baby for many years, she did the research and put the concept and financial papers together, and most importantly, she found us Raymond Miranda, who was then identified as the Head of Enfiniti Academy, and given the task of creating modules and the mechanics of running a school, but we have since widened his scope of responsibilities to make him Group Vice President of Content and Strategy at Enfiniti Vision Media. But on a personal note, the one person whom I really want to thank, for always pushing me to go for the stars and make the impossible happen, is my husband Effendi. It’s very generous of Ramin Karimloo, Simon Bailey and my dear friend Stephen Rahman-Hughes to agree to officiate ENACT today. They do this purely out of goodwill, out of their personal passion for musical theatre, and wanting to contribute to the growth of the Malaysian arts industry. They will forever be recognized as the 3 biggest stars of the West End, who officiated the Enfiniti Academy of Musical Theatre and Entertainment Arts, who gave the ENACT the prestige and stature. My hope is that ENACT will be a legacy we can all leave behind for the continuance of the growth of the Industry. Thank you once again for joining me on this very special occasion, the launch of Enfiniti Academy of Musical Theatre and Entertainment Arts. This inspirational quote by W. Clement Stone was used during Datin Seri Tiara Jacquelina’s talk, entitled PGL: Folklore Storytelling And Its Adaptation Into Modern Culture, at the recent Kre8tif Digital Content Conference in Putrajaya recently. An apt description of the award-winning actress, producer and arts activist. She had refurbished a beloved folk tale and successfully etched it into the country’s popular culture. Released as a feature film in 2004, Puteri Gunung Ledang became the first Malaysian film to be considered for an Academy Award. A year later, it was adapted into a stunning musical, which ran for four successful seasons, one of which was staged in Singapore. During her talk, organised by Multimedia Development Corporation (MDeC), the mother-of-two explained that the country has a treasure trove of unique stories with universal appeal and a distinctive Asian flavour. She said local folklore, legends, history, news and even grandmother’s stories can be explored as potent subject matters for creative productions. As managing director of Enfiniti Vision Media, she has produced TV content, films, musicals and various events, including the biographical P. Ramlee: The Musical, which won six awards at the Boh Cameronian Arts Awards in 2007. Here, Tiara tells Life&Times more about her craft and plans. PGL has gone from film to many other things. Any further plans? The sky seems to be the limit these days as technology and new media platforms continue to evolve. My team and I are constantly looking to make the PGL brand fresh and relevant. I have some new ideas after meeting many interesting people at the Kre8tif conference, so we’ll see how it goes from there. Describe the whole journey of getting PGL off the ground and the success it has become. It has been a humbling and eye-opening experience. It has allowed us to believe in the possibility of fulfilling a big dream on many levels, including a national one. It’s wonderful to see how PGL has changed the way the game is played for our local industry. As an industry, we’re now more confident about competing with the world’s best, moving away from a mindset of mediocrity to slowly getting recognised for producing world-class creative products. After the success of PGL, do you find it much easier to get funding for similar projects? It was impossible in the beginning, but now corporations have come to believe in the Enfiniti brand. I hope this year will see more and more corporations supporting creative projects through CSR (corporate social responsibility) so the arts and entertainment community will continue to survive in this country. Will, passion and determination aside, it takes a lot of money to put on a show or film of international quality, one that will continue to keep our local audiences entertained and in the process, inculcate a cultured and well-rounded society. What role can the government play in supporting the arts? The government can play a huge role, like pass a ruling for tax exemptions for companies that support local arts and entertainment. I’m sure we will see more corporations come forward to help if that happens. That’s how the Korean creative and entertainment industry has become so big and can afford to take on the world. What are your thoughts on local animation productions? Any plans to get into that? During the Kre8tif conference, I got a sense of a wonderful new energy from young local talent who attended my talk. It’s reassuring for producers like me to see how a government agency like MDeC is working with the industry to support and grow local talent. I also got a sense that we’re not short on craftsmen and actual animators, but the animation industry needs more producers and content developers to move projects. I hope to embark on our first animated feature film soon — if I can get the support of the government and the funding. I have a few good stories up my sleeves that are ready to go when the time is right. As an individual who dares to dream with many mountains to climb, what are some of your upcoming projects that you’d like to share? This year marks a new decade and the beginning of many exciting new ventures for my team. We aim to be more actively involved in the industry’s value chain, from training and development of new talent, to providing platforms for talent to grow. Ultimately, we hope to move our content into the regional sphere in the coming years. That’s as much as I can share right now, but wish us luck! Gosh... I've come quite a way, it seems. I THINK that black and white photo of me was taken at my very first ever press conference, for the Indonesian-Malaysian film Irisan-Irisan Hati. I was such a kid then. But I have a story about Irisan. 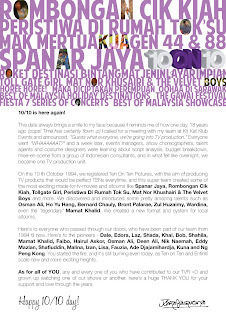 My company was chosen to do the casting for the Malaysian actors in the film, and I remember we combed through every film and TV actor, then every singer, then we looked at models and TV commercial talent, before arriving at the final selection of the Malaysian actors you see in the film. But Bustal Nawawi, the film's executive producer, still hadn't found the right girl for Ipah, the Malay Kampung Girl from Johor who finds Hadi (Deddy Mizwar) washed up on the shore and saves him and later they get married and she discovers he had a wife in Indonesia (Christine Hakim). Anyway. He finally said, "You audition." And I said NO. I said I didn't want to be an actor. I'd done like one Malaysian film once and I was NOT impressed and I said to myself that acting was SO not for me. Firstly, filming was stretched over 2 long years, it was ridiculous. I didn't like the way actors weren't allowed to have any opinion, and were just TOLD to do this, move like that, say it like THIS, feel like THAT. Stuff this, I said. I wanna do what I want to do. But I wouldn't mind being the gal who calls the shots. Who moves and shakes the business, who shapes the projects, who makes things happen. I wouldn't mind being the producer. Anyway. Pak Bustal knew that I was on my "I wanna-be-an-entrepreneur" trip then, and he said to me, "OK I'll make you a deal. You audition, and if you're right for the role, I promise you I will personally teach you the business of film-making. I'll teach you to become a PRODUCER." B-I-N-G-O. That's really the story of how I started out. Sign up for 4 Indonesian films, I'll teach you the business. Done deal. And man, look where all that has led me today. "Champion of The Arts", eh? That's a SUPER way to kick off 2011. Thanks very much Dennis. I'm all fired up, and I ain't gonna be hangin' up my cape for a long, long time. The year has only just begun. THE name Datin Seri Tiara Jacquelina is synonymous with the acclaimed musicals Puteri Gunung Ledang and P. Ramlee, both staged at Istana Budaya, Kuala Lumpur, over the last decade. From a model, dancer and actress, she has worked hard to become a champion of the arts. During her schooldays, she was active in theatre and had appeared in many print and television advertisements, most notably Hazeline Snow. This ad, which used American pop star Cyndi Lauper’s award-winning song Time After Time as background music, had Tiara running on the beach with a white horse. 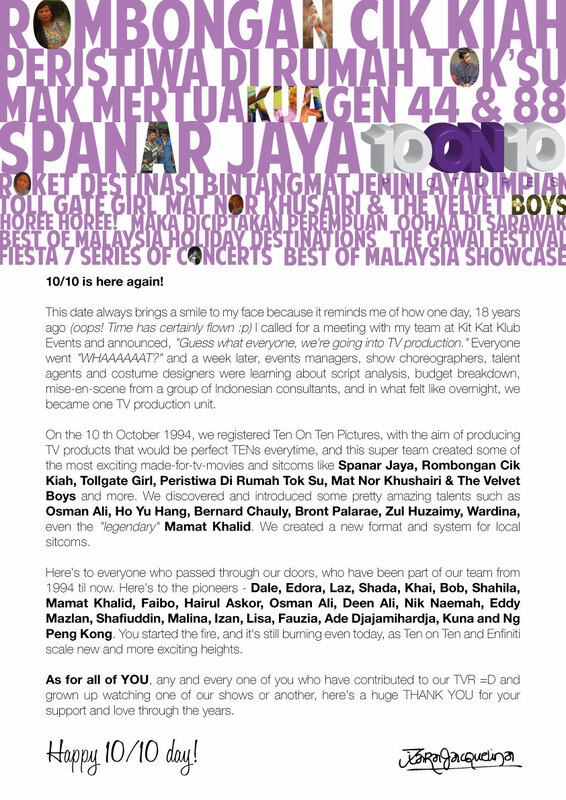 Tiara later hosted talk shows on RTM such as Selamat Pagi Malaysia. In 1995, she appeared in popular director Datuk Paduka Shuhaimi Baba’s acclaimed film Ringgit Kasorrga with Hans Isaac. The role earned her Best Actress at the 12th Malaysian Film Festival. She also starred in the Hollywood film Beyond Rangoon with Oscar-winning actress Frances McDormand. She produced Puteri Gunung Ledang The Movie in 2004 and starred as the title character, alongside M. Nasir (as Malay warrior Hang Tuah) and Adlin Aman Ramlie (as Sultan Mahmud Shah 1 of Malacca). She produced Puteri Gunung Ledang The Musical a year later, with British-Malaysian actor Stephen Rahman-Hughes taking over Nasir’s role. P. Ramlee The Musical won six awards at the Boh Cameronian Arts Awards 2007. It also marked pop queen Datuk Siti Nurhaliza’s musical theatre debut. In 2009, Tiara became the first female principal of Astro’s popular reality talent show Akademi Fantasia’s seventh season. Last year, she became Malaysia’s adviser for the performing arts section of the new Guide To Malaysia. The book, in its eighth edition, is published by Leisure Guide Publishing. Tiara, a mother of two, is managing director of Enfiniti Productions, which produces musicals, films and television programmes. Her dream is to set up an academy for the performing arts that caters to all Malaysians with talent. It is not the critic who counts, nor the man who points out how the strong man stumbled, or where the doer of deeds could have done them better. The credit belongs to the man who is actually in the arena, whose face is marred by dust and sweat and blood; who strives valiantly; who errs and comes short again and again; who knows great enthusiasms, great devotions; who spends himself in a worthy cause; who, at the best, knows in the end the triumph of high achievement, and who, at the worst, if he fails, at least fails while daring greatly, so that his place shall never be with those timid souls who know neither victory nor defeat.